The Rhine rises in the Swiss canton of Graubünden near the Austrian border and flows for 760 miles through Switzerland forming part of the Swiss-Austrian, Swiss-German and then forming the Franco-German border before entering the North Sea in the Netherlands. It is the second longest river in Western Europe after the Danube. In 21st century terms it is a motorway on water carrying essential commercial traffic, and leisure ships. Passage is not always on the river itself, man-made locks and canals assisting what nature has created. 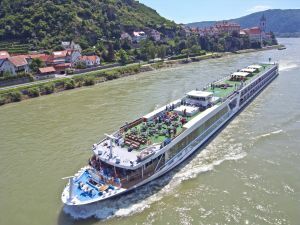 Your editor has travelled the Rhine before, east from Amsterdam to Koblenz (see BTN 5 May - Cologne) but this time around it was the full package, Scenic Cruises Basel to the Dutch capital, seven nights. Scenic is fully inclusive (including the tours, and also the bar) and we chose easyJet Gatwick to Basel, taking advantage of the excellent No 1 Lounge in the North Terminal. We exited the right gate (travellers have been known to find themselves in France rather than Switzerland, the airport having international status being shared equally between the two countries). It was a short taxi ride to the Hotel Spalentor, recommended, just outside the centre but within walking distance of the Old Town. We arrived a day early in order to take a look around this multi-lingual city, with English spoken too. Other Scenic guests came from a variety of UK airports or connected from all over Europe mostly by rail. Of 160 souls 88 were Canadians, 21 from down under, somewhat noisier plus an equal 18 from the UK and USA. is that the right figure in what is an expensive city. Dining out in a quality restaurant is at least London prices. We boarded Scenic Spaceship Scenic Ruby just after lunch, our taxi spotted by the alert staff who whisked us on board. None of the formalities of a deep sea cruise. It was straight into the lounge with a welcome glass of Champagne whilst they made sure our suite was ready and the complimentary mini bar filled. Then an introduction to our butler. They did check our passports but that was it. Not even a credit card was requested. Other than a visit to the wellness centre and hair dresser there is little need to spend money. A safety gathering is mandatory. At some point in the evening we departed. At most stopping points (you really can’t call them ports of call – except when moored overnight the Captain would turn Ruby around to point upstream) there was a choice of tours, normally in the morning with return for a late lunch and then casting off to the next destination. Afternoons in the main were restful. Day Two on the river and a stop at Breisach. Only officially invented in 1926 the Black Forest Gateaux must be the greatest marketing invention of all time, not only promoting the product but the region too. Irish Whisky comes from Foynes (but who knows that) and of course everyone has heard of Champagne, but where is it. The Black Forest area is one the prettiest and most hospitable parts of Germany. Our tour was destined for the Black Forest Open Air Museum (Vogtsbauernhof – Germans love long names) founded in 1964, a collection of genuine local history going back 400 years including six local farmhouses rebuilt on the site. There are 15 outbuildings, a chapel, granary featuring the life and workstyle from times past. It is one of Germany’s most popular educational theme parks, and you can reach it by train too. 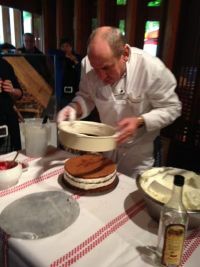 No visit is complete without a cake making demonstration and tasting. Three layers of sponge separated by a huge quantity of cream dolloped between and around the sponge, with various other ingredients. The tasting consisted of a very generous portion. Not much lunch was required. Day Three and the romantic and picturesque city of Heidelberg, home to Europe’s oldest university, including a visit to the historic Heidelberg Castle and Baroque style Old Town. No Mario Lanza and the drinking song but allegedly 30,000 students in residence. Not too much walking either, the coach dropping us within the castle grounds. Day Four: We moored at Rüdesheim in the early evening not far from the town centre and a chance to try the really local beers. In the morning it was all aboard the ‘Winzerexpress’ bound for Siegfrieds Mechanical Musical Instrument Museum, where we really enjoyed the guided tour of the many rooms in this fabulous museum complete with demonstrations. Then a cable car ride to the Niederwald Monument celebrating the unification of Germany in1883. It also offered a stunning panorama of the local scenery. The afternoon cruise was through the Black Forest gorge, with castles and history galore. French/German belligerence makes the Wars of the Roses seem simple. Day Five: Koblenz was next up, the coming together of the rivers Rhine and Moselle. We’ve been before and therefore missed out on the trip to Cochem with its delightful Reichsburg Castle perched on top of a hill. The alternative was a walking tour of Koblenz, itself filled with traditional German charm. 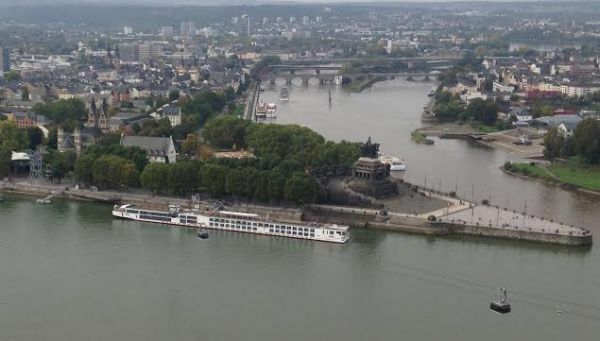 The town’s abundance of cultural monuments and historic buildings, cosy lanes and narrow alleyways, and the relaxed and happy atmosphere of its squares and river promenades make Koblenz a friendly town where its guests feel right at home. Across the Rhine, via a controversial chairlift (It offends UNESCO who designated the area a World Heritage Site) is the remarkable Ehrenbreitstein Fortress. There is not really a lot to see but it is huge and worth a visit. Close by our mooring spot was a massive memorial to Wilhelm I, unveiled by his grandson “Kaiser Bill” in 1897. Day Six: Business Travel News has been to Cologne previously this year. For river cruise visitors it makes for a very good day. We however chose the alternative Düsseldorf. 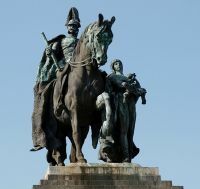 There is plenty of European history in Düsseldorf. Napoleon passed this way. They also drink a lot of beer, at what they claim is the world’s longest bar. Day Seven: Finally Amsterdam and a mooring not far from the main railway station. First the Captain’s farewell dinner and then a full day for exploring. We chose the trip to the North Holland’s seaside village of Volendam, stopping also in Edam to sample the delicacies of its namesake. Volendam was once a fishing village in the early part of the 20th century, it becoming an artists' retreat, with both Picasso and Renoir spending time here. Today it is a busy resort. Back for lunch and then off for an afternoon walk to the National Maritime Museum. This is housed in a former naval storehouse. Moored outside is a (1990) replica of the Amsterdam, an 18th-century ship which sailed between the Netherlands and the East Indies. Day eight after a nightstop on the ship the trip is over. But even here Scenic sets itself apart from other operators. No putting your suitcase out the night before departure, but just a leisurely breakfast, goodbye to the friends you have made, and then either on the coach to the airport, or to Amsterdam’s Hilton Doubletree for hospitality. We fancy the Rhône Valley next time. PS. Nothing to do with this ON TOUR and really it should be for our motoring edition but we spotted this perfect gorgeous Austin Healy 300 parked in the street in Basel.